We’re been reading and hearing about buyouts and layoffs in the media industry. On a more personal level, we are receiving e-mails and phone calls from former students who are losing their media jobs due to the big changes in the media industry. But hearing that The Rocky Mountain News has gone out of business still is shocking, with its circulation of more than 400,000 and several Pulitzer Prizes. 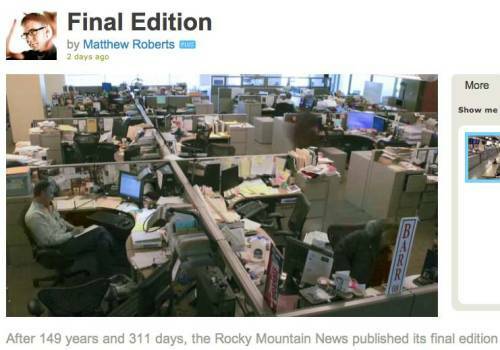 “Final Edition” provides a concise and insightful view into the newsroom, the lives of some of those working for the paper, and the Denver community. The video currently also is posted on The Rocky Mountain News Web site, but I think the Vimeo Web site may be more reliable in the long run.